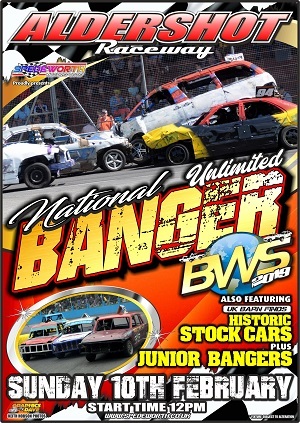 On Sunday 10th February 2019 the National Banger World Series is back and heads to Aldershot Raceway to start the 2019 campaign! Traditionally the first BWS round was held at the now gone but not forgotten Wimbledon Stadium but for 2019, round number one will debut at Aldershot Raceway as the venues season opener event! The BWS will retain the current format of racing with Heats, Wild Card Final & The Showdown. The heats are run to find a winner who then gets to take part in the random draw before the Wild Card Final to determine whether he/she starts at the front or rear of the grid. The winner of the Wild Card Final is awarded an automatic seed into the Unlimited National Banger World Championship which takes place at Foxhall Heath Stadium, Ipswich on Saturday 5th October. Completing the days action is The Showdown! 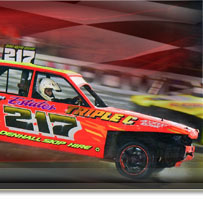 A race designed to give the drivers involved the opportunity to win a big prize fund which can be even bigger if only one driver remains running at the chequered flag after wiping out their opponents in a destruction derby style. 2019 brings the debut of the Entertainers League to the National Banger World Series Events. This is open to not only Spedeworth / Incarace drivers but any driver who participates in a BWS round. *Fresh / Un-raced cars will receive 20 points. *Painted cars upto 20 points. *Unusual cars will receive 20 points. *Entertainers race points upto a maximum of 50 points per meeting. The top three drivers in the league at the end of the BWS series will automatically qualify for the National Banger World Final at Foxhall Heath Stadium, Ipswich on Saturday 5th October 2019. Bookings are being taken now and can be made by calling 01252 322920, on the text service 07501 828911, by email info@spedeworth.co.uk or complete the drivers booking-in form via the link below.